The d:dicate 4006ER Omni Microphone with Active Rear Cable by DPA is designed for capturing audio. It features a 3.5cm length, providing a small, lightweight microphone for top-quality recordings. The microphone offers an omnidirectional polar pattern and a frequency range of 10 Hz to 20 kHz. It can be used in various environments, such as theater, recording studios, concert halls, places of worship, and similar applications. The 4006ER's clean look and recording quality allow for use as an A-B stereo or Decca Tree pair in concert halls. 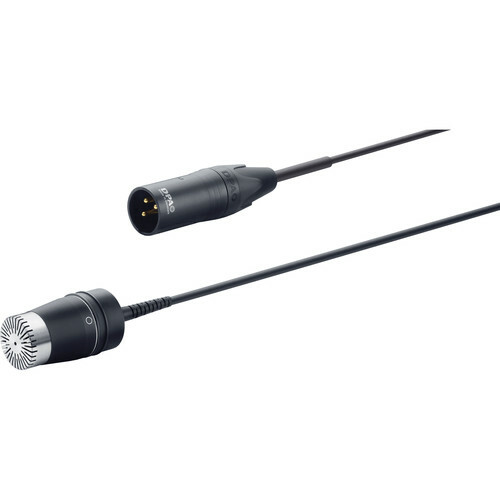 Separately sold acoustic modification accessories enable you to change the microphone's grid, providing several unique frequency responses and directional characteristics in a single microphone. The package includes an SM4000-C suspension mount. Box Dimensions (LxWxH) 12.0 x 8.0 x 4.0"